Born in Budapest and grew up in Chicago where he received PhDs in both history and in economics from the University of Chicago. He studied with the Nobel-Prize winning economic historian Robert Fogel. Komlos taught at Duke, Harvard, North Carolina at Chapel Hill, and the University of Vienna. Nobel-Prize winning economic historian Robert Fogel suggested that Komlos research the impact of economic development on human biology. Komlos devoted most of his academic career developing and expanding this research agenda, which culminated in his founding the field of “Economics and Human Biology” with the journal of the same name in 2003. Paul Krugman wrote about his work http://select.nytimes.com/2007/06/15/opinion/15krugman.html?scp=1&sq=Krugman%20June%2015%202007&st=cse as has The New Yorker magazine: http://www.newyorker.com/archive/2004/04/05/040405fa_fact. Through that research program he became a humanistic economist and has been writing about current economic issues including blogging for PBS [https://www.pbs.org/newshour/author/john-komlos] from a humanistic perspective. 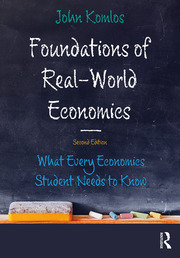 His textbook, Foundations of Real-World Economics, advocates for a “Capitalism with a Human Face”. He has been awarded research support from the German Science Foundation, the U.S. National Science Foundation, the National Endowment for the Humanities, the American Council of Learned Societies, the American Philosophical Society, National Academy of Sciences, and Fulbright-Hays Fellowship. His publications appeared in such journals as the American Economic Review, American Historical Review, American Journal of Human Biology, and Economics and Human Biology, His books were published by Princeton University Press, the University of Chicago Press, and the Oxford University Press.